Cindis World: #Kroger Cartbuster Savings Event & $25 Kroger Gift Card #Giveaway! #Kroger Cartbuster Savings Event & $25 Kroger Gift Card #Giveaway! Have you heard? The Cart Buster Savings Event is back at the Kroger Co. Family of Stores! From July 31st through August 17th save on tons of brands across more than 100 categories from General Mills, PepsiCo, Unilever, Heinz, Mars, Wrigley and Kimberly Clark. Look for big savings storewide at the Kroger Family of Stores, which includes Kroger, Ralphs, King Scoopers, City Market, Dillons, Smith’s, Fry’s, QFC, Baker’s, Owen’s, Jay C Food Stores, Hilander, Gerbes, Food4Less, Fred Meyer, Pay Less Supermarkets and Scott’s food & Pharmacy. Don’t let the savings stop there! Make sure to follow the Cartbuster “Deal of the Day” beginning August 3rd and running through August 16th. * Download exclusive offers, on more of your favorite brands, directly to your shopper card, by visiting http://bit.ly/cartbustersavings, beginning Wednesday, August 3rd. Remember,http://bit.ly/cartbustersavings is your link to all of the details, savings and the special “Deal of the Day” offers for the Cart Buster Savings Event, exclusively at the Kroger Co. Family of Stores. 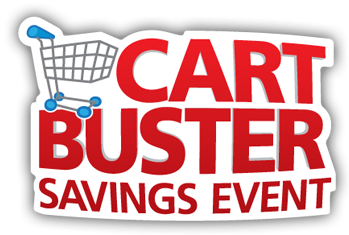 The Cart Buster Savings event beginning July 31st. “Deal of the Day” offers begin August 3rd. And it gets even better! Kroger and MyBlogSpark have not only provided me with a $25 Kroger gift card so I can take advantage of this awesome Cartbuster event, but they are also giving one of you one! To enter: Leave a comment telling me ﻿which of your favorite products you are most excited to find savings on during the Cart Buster event at Kroger? Please be sure to put your email address so I can contact you if you win. To prevent being spammed : itscindisworld at yahoo dot com is the best format to use. If you would like additional entries: Do any or all of the following and leave a seperate comment telling me each thing you did or that you already have done them. Winner will be chosen via random.org on Wednesday, August 17th at 12 pm EST. Good Luck, and thank you in advance for entering! I'm excited about Honey Nut Cheerios! I am most excited about freaking all of it! We have 8 in our house so all the deals are a big help! I will buy the Honey Nut Cheerios. I will be looking for the Cottonelle products! I'm excited to stock up on Cottonelle toilet tissue. It would have to be Honey Nut Cheerios that I am most excited about. I am excited about the HONEY NUT CHEERIOS! Yummy! I am excited about viva papertowels! Thanks for the chance to win! I am most excited about stocking up on cereals like Honey Nut Cheerios. I'm most excited about Honey Nut Cheerios. I'm excited about Honey Nut Cheerios. It is my absolute favorite cereal, but I only buy it if it's on a great sale! I am so excited about the entire trip! There are going to be so many great deals as a new coupon diva that I aspire to be! I love Heinz and there is always a coupon and they are always running a store special. I can usually get it for free or 20 cents. I'm excited about the Gatorade and COttonelle. I love me some Diet pepsi 2-liters!! I'm happy to see Dove Haircare products. I'm excited to see Cottonelle, Yoplait and Pedigree on sale. I love Kelloggs cereals topped with fresh fruit! Honey Nut Cheerios! We go thru alot of boxes! I am excited about all of it, but the HUggies diapers are the deal I am most excited about! I'm most excited to save on Pepsi products. I am most excited about the cereals!! I Like Its Cindi S World on Facebook - emillie rose. I Follow Its Cindi S World on Twitter - hisprincess8886. I Follow Its Cindi S World via Google Friend Connect - emillie. I am most excited for the cereals for my hubby! I am over from Thrifty Mama's Link Up. I'm always excited to find healthy things i can put in the kids' lunch boxes. Hard to find sometimes, so it's super exciting when they are included!